While I was hoping for a White Christmas in Illinois this year, I definitely got my snow fix in New York this December. Compared to last December, it snowed A LOT this month. I didn’t mind all of the snowy days though because they made the holiday season that much more festive! That skirt is the cutest thing, love this outfit. 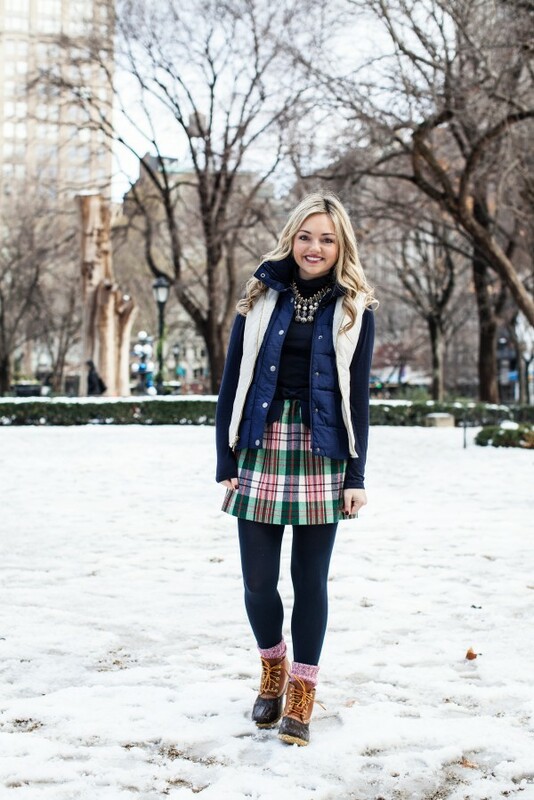 I love that you paired these snow boots with tights and a skirt! Super cute! Absolutely in love with this layered look! Hope you’re having a wonderful time at home! You looks so cute Jessica! Love those boots! How long did you get to visit home? 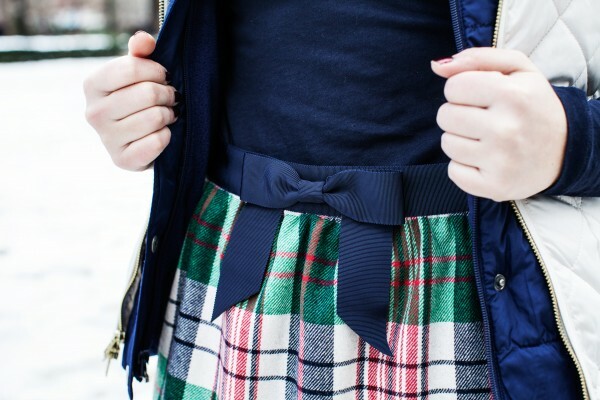 Ok, that skirt is just too cute for words. I love the bow detail! 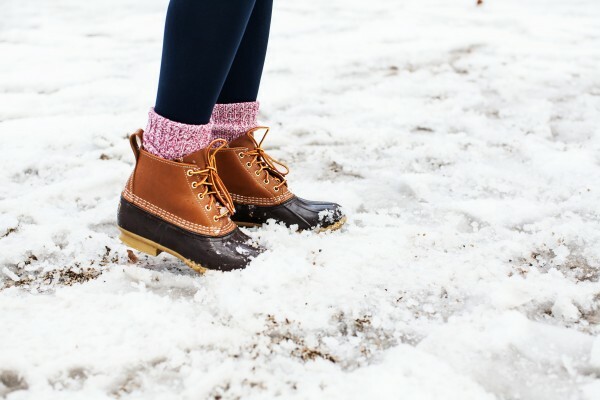 Love the duck boots! I need a new pair of those babies. This looks so cozy!! Love how you layered! Love this outfit! 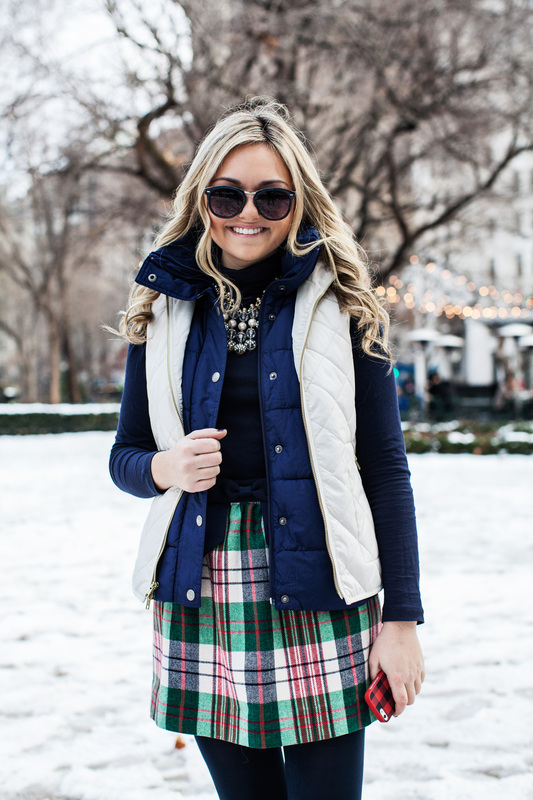 You’re so adorably preppy! I feel the same way about the snow! Love this look! This is such an adorable plaid! I love this outfit for a day in the snow. Love the tartan with the navy they go together so well. I’m really jealous of everyone that’s had snow – we usually get some in London during the run up to Christmas but nothing this year. And even when I came home to Scotland we’ve had nothing but rain! It’s so unusual! So jealous! That skirt is beyond adorable. Love the skirt! Such a fun option for the holidays. I too have been loving all the snow this year! Actually looking forward to another big snowfall this week. Obsessed with this outfit! Hope you had an amazing Christmas!! Love the touch of pink! Real girls wear duck boots! So practical and fun with the skirt! You are very beautiful with this mood. I could totally use some snow boots like these, but I’m secretly hoping it won’t snow any more in NY this year 🙂 I got snow at Christmas when I visited my parents in Buffalo, that was enough! I love seeing outfit pictures taken in the snow! We haven’t had any here yet this year! Oh my goodness, you are too adorable! Love all the layering magic going on here. Love this skirt- it’s so cute! Only you could make snow boots looks this cute. Love that necklace! Your cosy winter separates look great against the snowy backdrop. I know snow can be a pain but it makes for amazing photos! We’ve had a really mild winter so far in England, I miss the snow! this publish is written by means of him as no one else recognise such designated approximately my difficulty. may have regarding the use of our templates. considered throughout creation of an automated Foreign currency trading technique. a vewry excellent uncanny feeling I came upon exactly what I needed.